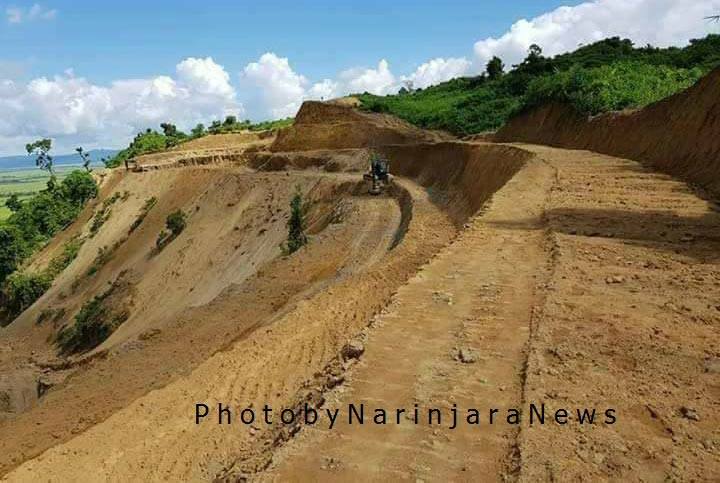 Construction of a new rough road on Rakhine State’s Mayu Mountain will be completed within a few days, a state MP said. The road will connect Mayu Kam Zaydi Pyin Village in Rathedaung township with Indin Village in Maungdaw township, passing through Mayu Mountain. “The construction of the rough road is nearly completed. It will be completed within a day or two,” said U Oo Than Naing, Rakhine State Hluttaw MP for Rathedaung township, who visited the road construction site. Though the road is only 14 miles long, there were challenges in building it through the mountain, he added. Observers said the road would ease between Maungdaw and Rathedaung townships, thereby playing an important role in the district’s commercial and military affairs. U Khin Maung Myint, director of Rakhine State’s Roads Department, told the media that the 40-foot-wide rough road, which is built with the use of 15 machines, will be upgraded to a gravel road in 2017-18. Another mountain road will also be built on Mayu Mountain with the help of the Union’s special discretionary state budget, he said. The Department of Rural Development is also looking to upgrade the road from A Ngu Maw to Kyain Chaung in Maungdaw township into a concrete route along the western side of the Mayu Mountain. Another road will be built from A Ngu Maw to Zaydi Pyin, Nyaung Chaung, and Buthidaung township on the eastern side of the mountain. By David Coursey Google has responded to anger over its Buzz social network with an apology and second round of privacy-related changes. Google Responds to Buzz Privacy Issues. Again30688868 The latest move replaces the controversial "auto-follow" feature with something Google calls "auto-suggest." Saturday's revision was the second major change to Buzz since the service was introduced last Tuesday. Since then, Google had been besieged by complaints that Buzz endangers user privacy. Myanmar is situated in the Southeast Asia; its neighboring countries are Bangladesh in the West, India in the Northwest, China in the Northeast, Laos and Thailand in the East. It is well known as one of the Theravada Buddhist Countries in the world, and the population of Myanmar is over fifty million with 135 ethic groups of which the main national races are Kachin, Kayah, Kayin, Chin, Bamar, Mon, Rakhing and Shan.